After getting through the craziness of tax season, it’s easy for me to reflect on a long and difficult work period with positive thoughts. 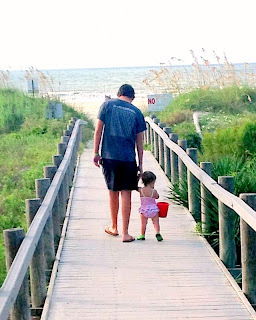 Some time ago, I posted a photo of my children, Josh and Ava, walking down the boardwalk toward the beach on Hilton Head Island. I didn’t think much about the significance of that photo when it was taken, but it certainly seems to have made an impression on some of the people that saw it. I received a lot of compliments on the photograph, and to my surprise, a close friend of mine for over 40 years even painted a rendition of the photograph for me. I was grateful to receive this special gift, and promptly hung the painting in my house. In fact, I was so touched by my friend’s gift that I asked if she would do another, larger format painting of the photograph to hang in my office. I recently received the painting and had it framed, and now it is hanging proudly in my office. The next time you’re visiting my office, I will show it to you. In the meantime, here’s the original photograph and a picture of the painting. Isn’t it fantastic? 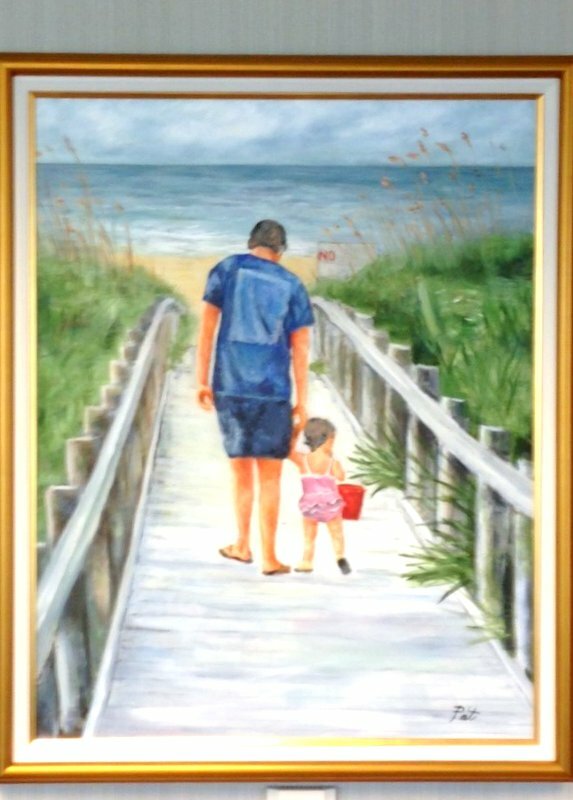 A special thanks to my talented friend, Patricia Brown, of Hilton Head Island, South Carolina, for painting this wonderful moment for me. Looking back, Sam and Pat Brown were some of my first friends when I came to Atlanta in 1972. Sam became my mentor, my employer, and later on, my client. Sam passed away unexpectedly a few years ago, and those of you who remember my printed newsletter, The Rollins Report, may remember my personal note about our friendship. I miss Sam a lot, and I am grateful that Pat and I are still old friends. Looking ahead, I am also reminded that Joshua and Ava both celebrate birthdays during May. 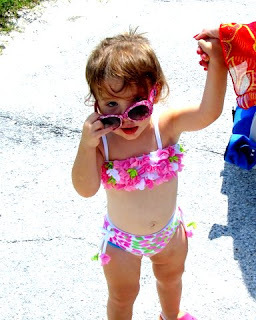 Joshua will turn 18 at the beginning of the month, and at the end of the month, Ava will turn 2. Joshua is also graduating from high school and will begin his college career in the fall. Ava is beginning to talk and is a lot of fun most of the time – the “terrific twos” aren’t always so terrific. 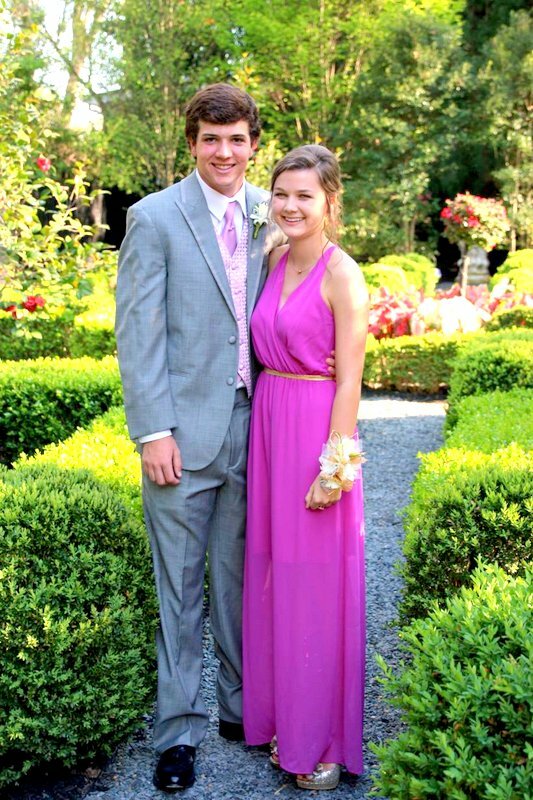 Josh recently attended his senior prom with his girlfriend, Carter, and here is a picture of them all dressed up for the festivities. 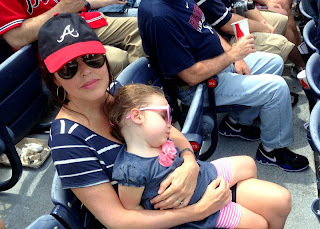 To be fair, here are some pictures of Ava, one of which shows her enjoying this past Wednesday’s Braves game. I have assumed that every now and then, you would like to read something other than financial and tax news. So, the purpose of this post is not to bore you, but to show that some things in life are more important than the stock market, tax rates and other financial obligations. I hope you are doing well and enjoying your own families during this beautiful spring! 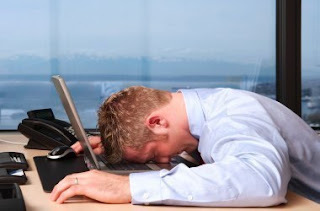 Due to a very “taxing” couple of months, Rollins & Associates and Rollins Financial will be closed on Friday, April 19th in order to regroup/sleep! Thank you for your understanding and for allowing us the opportunity to serve you. If you have any pressing matters that require our immediate attention on Friday, please feel free to contact Joe Rollins at 404.372.2861 or jrollins@rollinsfinancial.com. Our offices will re-open for business on Monday, April 22, 2013. RECORDS, RECORDS, RECORDS! BUILDING WEALTH NEVER GETS BORING. From a wealth-building standpoint, 2013 has been nothing short of great so far. Both the Dow Jones Industrial Average and the Standard & Poor’s Index of 500 Stocks set new all-time closing high records during the quarter. Even though many pundits said in 2007 and 2008 that the financial markets would never recover from the financial meltdown in the United States, once again, they were wrong. From the lows of 2009, both major market indices have recovered completely and set new highs during the first quarter of 2013. For the month of March, the S&P 500 gained 3.8% and is up a sterling 10.6% for 2013. The DJIA was even better, as it was up 3.9% for the month of March, and is up 12% for 2013. The tech-heavy NASDAQ lagged during the month, but the numbers were still quite good; it was up 3.4% for March, and up 8.5% for 2013. On October 9, 2007, the S&P 500 reached a high of 1,565; that index closed at 1,569 for the month of March – a new high! The DJIA also reached its prior all-time high of 14,164 on October 9, 2007, and finished the first quarter of 2013 at its new all-time of 14,578. While it’s great that these new highs were achieved, I can’t forget how much wealth was squandered by investors during the intervening six years. Many investors withdrew their money from the stock market entirely during the 2008 meltdown, and some of those investors have never reinvested. More importantly, there have been countless numbers of investors who have not invested a dime during this six-year period. If I’ve heard it once, I’ve heard a thousand times that some investors will only invest again “once the market recovers.” This is the worst strategy for an investor to take when it comes to wealth-building. So many investors would be in a better position had they invested on a monthly basis over the intervening six years. Almost all investors can afford to contribute some fixed amount to their investments each month. Unfortunately, so many choose instead to carry large balances in non-interest bearing checking accounts, and more often than not, they invest lump sums at irregular times. The best approach to building true wealth is to invest regularly and consistently, regardless of whether the market is high or low. 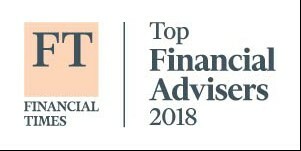 We frequently receive inquiries from clients asking if it’s too late for them to take advantage of this stock market rally. So much skepticism has been built over the last six years that it’s hard for the average investor to see how well the market can do when times are good. I am, however, stunned by the investors who keep huge sums of money in non-interest bearing accounts simply because of their fear of the unknown. No one knows what the future will bring, but I foresee no fundamental change in the investing arena today from what I saw three years ago. Unquestionably, there are many problems in the world, but the economy continues to be slightly higher, earnings continue to be at record levels, and interest rates are unbelievably low. Those three components alone will lead to higher stock prices going forward. Investors are seemingly unaware of two major economic events that are occurring in the U.S. economy. First, there’s been an explosion in the production of oil occurring in the U.S. unlike anything that’s happened in decades. It’s no longer a misplaced dream to think that we could be energy independent in our lifetime. In fact, there is a high likelihood that the U.S. will become an exporter of oil in the next 20 years. That concept may be hard to imagine given the dependence we have had for the last 30 years on imported oil. Even though Washington throws up every roadblock known to man for increased energy exploration, it is happening notwithstanding the incompetence that surrounds our government. If federal lands were opened up for energy exploration, the potential for the U.S. to produce all of the oil it needs would come sooner rather than later. Even so, production is reaching all-time levels and oil production is changing the economies of many states. I wonder how many Americans could get higher-paying jobs if these oil exploration efforts were expanded. While this is a limited market set, on my street alone there are at least 10 new houses under construction, but it still indicates that the turnaround in residential construction is beginning. While house prices may not soon reach the exorbitant levels of a decade ago, just like the stock market, house prices will recover. There has been a slow and steady climb of inflation in labor and building materials over the last decade. Unquestionably, when new houses begin construction in earnest, that inflation will be reflected in house prices and will increase the value of existing and new homes. For the last three years, there has been a Wall Street axiom that has held true. In each of the last three springs, the saying “sell in May and go away,” was realized. We have suffered through spring and summer months where the market drifted down only to rally again at the end of the year. While I don’t expect a major sell-off this summer, it’s perfectly possible for the market to drift down due to a lack of traders actively working over the summer months. However, until there is a pronounced reduction in corporate earnings – or an attempt by the Federal Reserve to increase interest rates – I fully expect to see higher stock prices at the end of 2013 than they are currently. When I look at all the investment opportunities, I see nothing that rivals the potential gain of the financial markets. With cash paying zero, CDs only marginally above zero, and bonds paying meager returns, there doesn’t seem to be a better choice than equity investing. We talk to clients regularly who are sitting on large cash balances waiting to take advantage of those gains. With excellent corporate earnings, low interest rates and an investing public with trillions in uninvested cash, I see the market going higher rather than lower in the coming months.